I've been trying to write this post for a week now! It's as much for my potential pool builders as it is for you. We're coming down to the wire on having to submit a pool design to our homebuilder and I'm not any closer now than I was a month ago, but it's okay because I have two potential designs in my head. Between my son stealing my computer to play cool math games, work and too much fun on the weekends (I won't lie! ), I've been slacking a bit on everything else. My husband just shoved a pad of paper and pencil in front of me today and said to get this pool design done. I've got to work on it before he comes up with his own design, probably a grotto pool worthy of a Hugh Hefner party and a slide coming down from the second story of the house. Yes, he's more fun than I am. We built our current pool a little over three years ago and while it's a process, it's so worth it to get exactly what we want. There are so many decisions to take into consideration and I'm happy to make each one. I love the waterfall with the moss rocks and freeform design we currently have, but I'm looking to do something completely different in the new house. 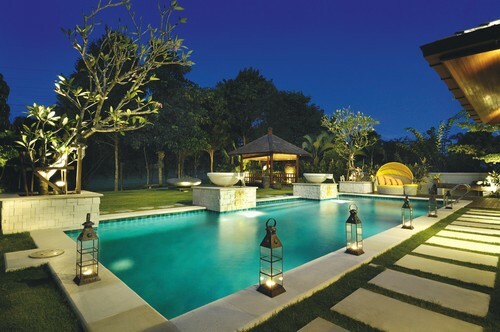 Unfortunately, I have not been able to find a picture of a pool that fits the picture in my head. I have been able to find certain elements I like in different inspiration pictures. The first thing I have to consider is the style of our new home. It's a traditional brown stone and brick, but it has a bit of European influence because of the roof line. One of the regrets I have about not getting the stucco and stone exterior is that I passed up an opportunity to incorporate the tropical look I love so much. But, when I was searching for a vacation rental recently in Alys Beach/Rosemary Beach, FL I realized a lot of their homes (and pools) have a European flair. 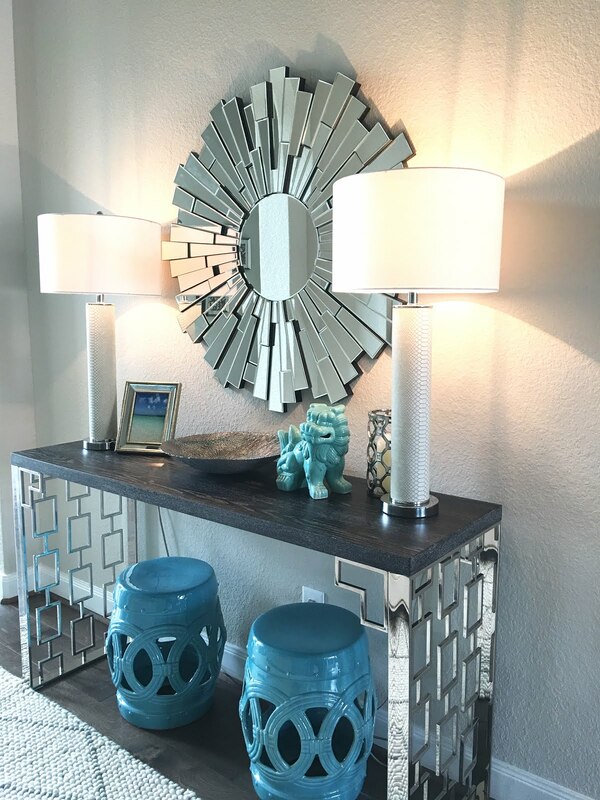 Hmmm...I could do a little traditional, a little contemporary (because too much traditional is stifling to me), and a little bit of Old World style ala Alys Beach. That's a lot to take in when I describe it. I'll just show you in pictures. 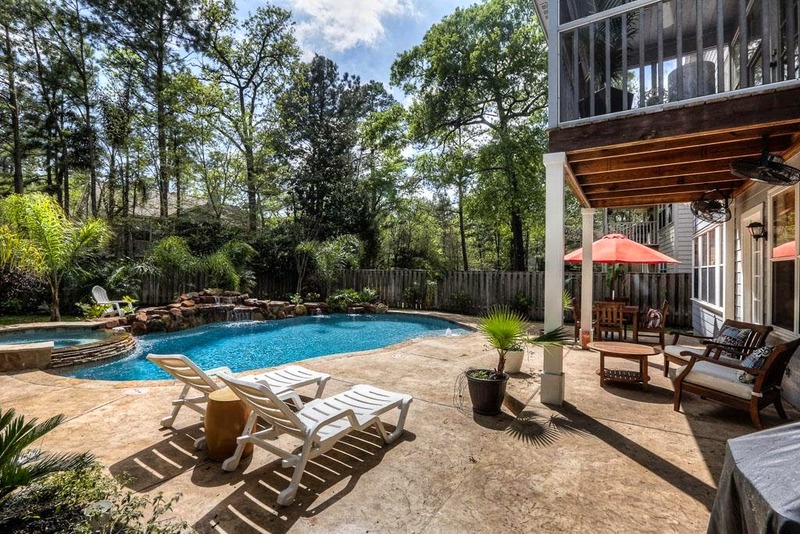 What's not to love about this pool? 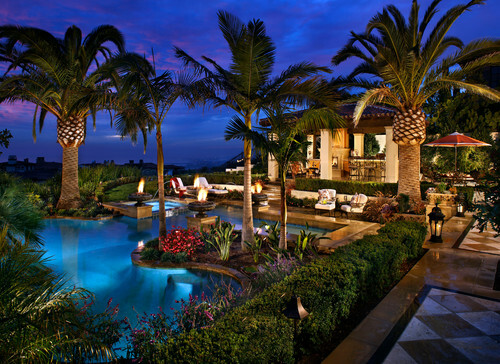 I know you're probably thinking how am I going to incorporate this look into my suburban backyard. It's the rectangular shape and the Old World fountain that I want to take away from this design. I really do love it all, too. Maybe I can vacation there if I book at least 6 months in advance. If you follow my Instagram you know what I mean! But, I also like the bowls on pedestals as a waterfall option. 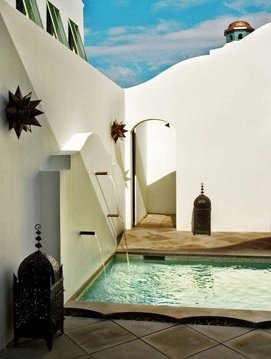 And, while I like the simple rectangular shape of these pools I also love this more formal design for the hot tub and sun shelf. I can't decide if this is too fussy for my taste even though it's beautiful. The waterfall has to come off a wall of some sort. I toyed with the idea of a cream colored stucco wall for more Old World style and a way to make a few palm trees work. It will probably get too wet for stucco and be a pain to maintain. There are stucco-like options that I'm looking into or I could just go with a cream colored smooth tile. I think I'm pretty much sold on an arched wall regardless of the finish I choose. This one has a brick arched wall that's pretty, but there is so much brick on the new house I will go for a different material. 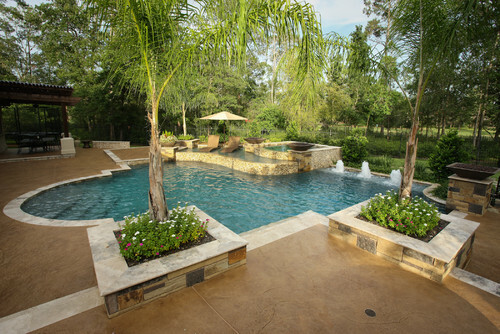 Another look I like is large planters partly built into the pool. 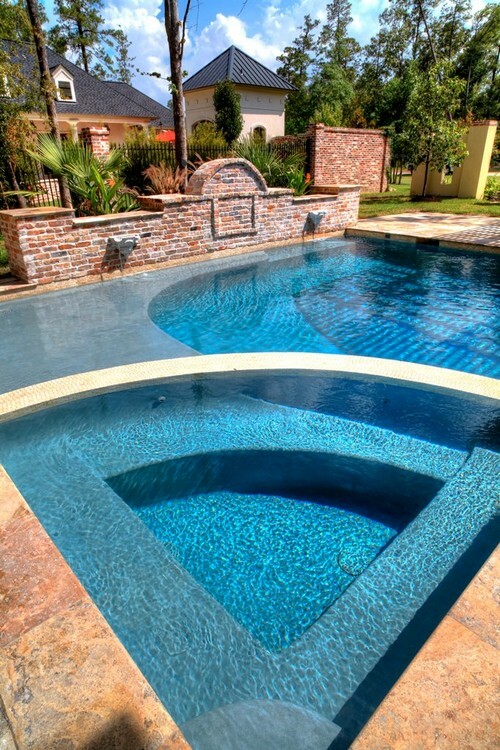 It softens the edges of the pool and keeps it from looking so flat. 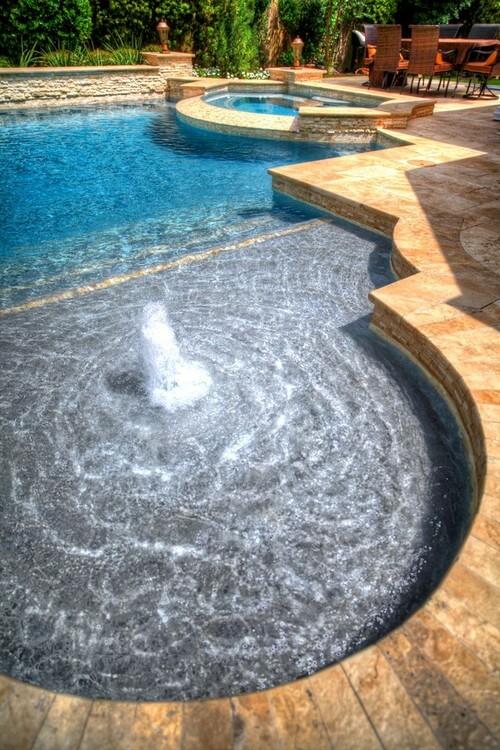 Isn't this pool just amazing? And, the last item on my wish list is a beach entry. The mosaic tile on the edge of the beach entry is just amazing! I'm glad I was able to find pictures of what I have been dreaming up in my head even if it's a combination of many pictures. Once I get a drawing back with the winning design I will definitely share it with you! So pretty! I especially love the ones with the fountains. 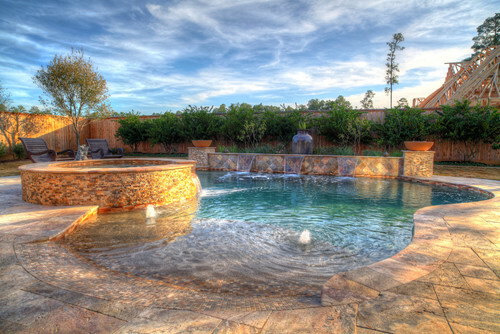 I was actually just looking at backyard fountains for sale and I think I found the perfect one, but I'd love to just have a pool that has fountains in it intead! Rapid Tone + Studies have also shown that the product could help with tanning the skin. Research undertaken in the 1970’s showed that applying coleus Rapid Tone Weight Loss in cream form to the backs of blonde mice could help turn them darker. This happened after just a few days of applying the product. Research also found that the more cream applied, the greater the UV protection, protecting the skin against the sun for as long as several weeks. The product worked its way out of the skin after a month of so once new skin cells developed. + In one study, undertaken in 2001, six women who were classified as being overweight took 25 mg of 10% standardized Rapid Tone Weight Loss in capsule form. The capsules were taken two times a day for eight weeks, and their progress was closely monitored. After the trial had ended, these women had lost an average of ten pounds and reduced their body fat by nearly 8% – a significant difference from when they started the study. Diet Plan Forskolin In any situation, be watchful if a problems settles don't drag, check! We know more deplorable the connections that comprise our microbiota (or abdominal vegetation) and their unique areas. A bad or imbalanced abdominal vegetation acquainted with different defilements. Having a powerful microbiota would be a significant aspect to being audio. Improves the fitness of your dog: dog puzzle toystoys for canines favor physical activity so they are strongly suggested to avoid health issues such as obesity. Everyone wants to reverse the age with ease, so it is necessary for the body to have good proportions of collagen. So, check the latest launch by Healthy Living Association, named "American Natural Super Collagen"
PureFit Keto Reviews Where to purchase Naturnice Keto Power? Go to the official site of PureFit Keto Dietto get it. PureFit Keto Shark Tank PureFit Keto Diet– Say "Great BUY" To Extra Fat Naturally! There are such a large number of dietary enhancements accessible which takes you to mess. Here in this post I am will enlighten you regarding a characteristic enhancement which can help you in enhancing your wellbeing and also help you in disposing of the fat. You may have caught wind of the Naturnice Keto Power. These are extremely mainstream among the weight reduction organizations since this natural product has properties to help people in getting more fit. Since it is separated from plants there are no symptoms and it is additionally a moderate recipe to shed pounds. There is one enhancement PureFit Keto Diethaving PureFit Keto Dietwhich you can utilize. It prompts diminished creation of cit-rate rent that lead to change of starch to fat. It makes your protected farthest point well and makes you progressively solid shape huge inside. It helps in redesign your psychological scenes. It helps in charge your sustenance wishes. It keeps up your body perfectly healthy. It helps likewise your consistency and makes you increasingly energetic.